Written by Rosemarie Parent, member of the Arrow Lakes Historical Society, using member Bruce Rohn’s extensive notes and photos gathered from his interviews of many crew members who worked on the boats over the years. He also gathered information from the Nelson Daily News and our own archives. 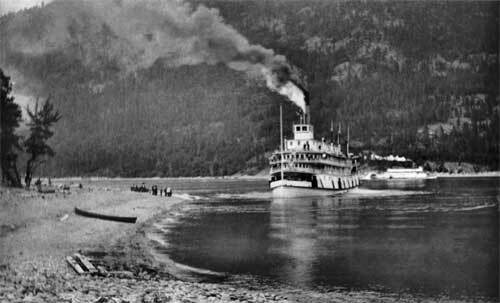 The SS Columbia, the CPR tug for the Lower Arrow Lake, performed winter service from 1920 to 1947. 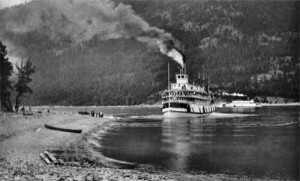 The Columbia was the first boat specially designed for the Lower Arrow Lake winter service. It was mostly a utility boat but had more passenger accommodation than other tugs used in this service. Construction started in September of 1920 and it was launched at the Nakusp shipyard on November 4th. The boat was finished just enough to get it through the Burton narrows under its own steam before the water dropped too low that winter. She had her finishing touches added at West Robson which were completed January of 1921. Because the 1921 winter season was mild, the Columbia didn’t operate until January of 1922, doing two round trips per week; Tuesday and Friday, northbound, and Wednesday and Saturday, southbound, between West Robson and Needles. There were complaints during her first few months of operation. She was not able to break the ice with her ice breaker and one time, the Edgewood Lumber Co’s tug Elco had to help the Columbia to the Edgewood wharf. The CPR built a smaller combined barge and ice breaker to be used by the Columbia for the remainder of her career. The winters of 1929 and 1930 were the ultimate test for the Columbia. In February of 1929, she broke her prop in heavy ice. A week later, service was suspended for nine days when her prop and barge were damaged by ice. Residents complained about the poor mail service due to the unreliability of the boat. They said the powerful tug Whatshan, in 1916, had worse conditions but by pushing a barge in front of it had managed to make it through the ice to deliver freight and mail on time. She had the power that the Columbia did not have. The 1930 season was even harsher. The prop broke again at Robson and at Syringa Creek a crew of eight men from Fairview Shipyards in Nelson came with two trucks and trailers with big timbers to the scene. In order to get her to shore and jacked up to change her prop, dynamite was used to clear a channel through the ice to the shore. This took four days and upon being released, she got stuck in the ice channel again not 200 feet from where she originally was stopped. “Big Bill” Fraser ran the Columbia most winters during the 1920s and retired in 1930. Because of seniority, Kootenay Lake captains such as Angus McLeod and Malcolm McLeod came over to run the Columbia for its winter season. This route was considered by employees as sort of an outpost, probably the least desirable of all the routes. The winters were less harsh than the 1929 and 1930 season and only caused minor delays. In her summer layup at Nakusp shipyard in August of 1937, the Columbia needed extensive repairs including a new boiler, but because they had to wait for replacement parts for the boiler and steampipe, it wasn’t until 1938 that she was able to work again. On the trial run to Broadwater, she had a hard time to keep up steam. Art Koch of Renata was on this trip and stated that it took 12 hours, they had to pull into shore several times to build up steam again. Also the smoke stack was too short and they couldn’t get enough draft, so had to install a taller one. Starting in May of 1938, the Columbia was used on the Minto and Beaton routes while those boats were laid up for repairs and refitting each year. However, there were no sleeping accommodations, no room for autos or freight, and had wharf landings only, whereas the Minto was able to land on the shores when summoned all along the lake. 1947 was the last year the Columbia would run. The Farmers Institute of Edgewood welcomed a delegation of CPR officials at the Edgewood wharf. They had come to discuss the problems of transportation because in fruit season, there was no available space on the Minto for items like hay, firewood or carloads of posts to go to the Prairies. Also there was no transportation between West Robson and Castlegar. The officials promised the services of the Columbia during fruit season for Edgewood and points north. When it was time for the annual layup and refitting of the boat in May, it was decided that the hull was in bad shape and not worth spending any more money on. After the summer fruit season run, the Columbia was retired. The boat changed hands several times until a farmer from Syringa Creek bought it. Its final resting place was at Balfour Bay just south of the dam. When the bay was covered in with fill from the building of the Hugh Keenleyside Dam in the mid 1960s, the Columbia was completely covered. Even though there were complaints about the Columbia‘s lack of power and ice breaking abilities in severe winters, she had a successful career serving the lower lake residents for 26 years.